Highway investments still have the power to redistribute urban development. The difficulty of predicting exactly how particular transportation investments will affect development patterns (and vice versa) has inflamed debate. Here in California, environmentalists committed to slowing suburban development regularly target proposed highways projects, contending they will induce growth or sprawl. Meanwhile, central city and transit advocates push for additional transit investments—especially rail transit—expecting that they will help revitalize central city neighborhoods and contain urban sprawl. The difficulty of empirically evaluating these claims adds to the rancor of the debate. 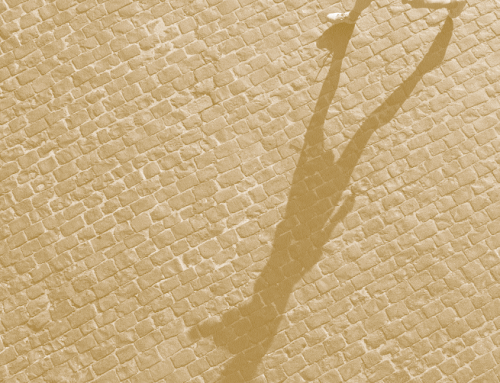 Urban simulation models offer a way out of this dilemma. 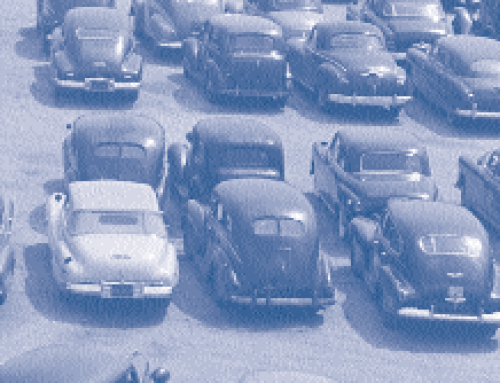 They enable planners and policymakers to reveal potential effects of proposed transportation investments before they are authorized or constructed. Until recently, most urban simulation models either functioned at too low a level of resolution (that is, they could evaluate zonal but not site effects) or were insufficiently sensitive to some types of highway or transit. Fortunately, however, improved state-of-the-art models are now improving our ability to evaluate these relationships. Here I want to show how one such model, the California Urban Futures Model, can be used to anticipate land use and development effects of two potential transportation projects—a tollroad and an extension of the Bay Area Rapid Transit (BART) system. 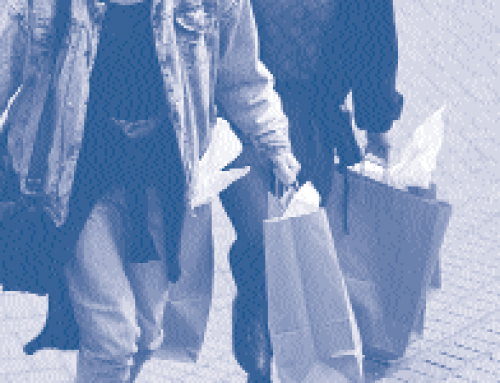 ACCESS readers were introduced to the first generation of the California Urban Futures Model in 1994. That version, CUF I, coupled a geographic information system (GIS) with a profit-maximizing model of developer behavior to project where and when new urban development would occur. Unlike other urban simulation models, CUF I could predict the site-specific effects of alternative growth policies and regulations. It could also analyze potential displacement or “spillover” effects—what happens to development when it is prohibited at particular sites. 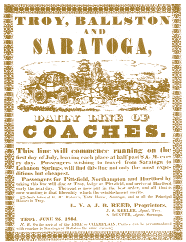 But CUF I could not deal with multiple land uses or simulate the development effects of transportation investments. CUF II remedies these shortcomings. It allows different urban land uses (e.g., single-family residences, apartments, retail shops, offices, and industrial plants) to bid against each other for preferred sites. It also allows previously developed sites to be redeveloped for different uses. The heart of CUF II is the Land Use Change Model—a series of statistical equations relating observed land use changes between 1985 and 1995 to various market, environmental, locational, and policy factors that influence development. Separate equations are calibrated for each county and for undeveloped and previously developed land. To demonstrate CUF II’s capabilities, we used it simulate how alternative highway and transit investments would effect future land development patterns in Contra Costa County, California. 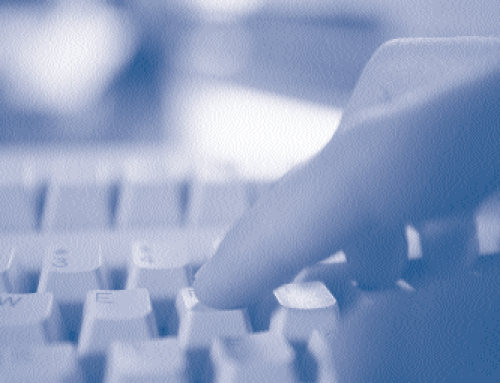 Why choose Contra Costa? First, the county will experience tremendous growth during the next fifteen years. The Association of Bay Area Governments projects the county and its constituent cities to add 240,000 new residents and 115,000 new jobs between 1995 and 2010. Second, growth there is likely to be highly malleable. Development precluded from one part of the county will be readily displaced to other parts. Conversely, development attracted to a particular location, such as a freeway interchange or BART station, may be drawn from locations throughout the county. Put another way, local transportation investments could have county-wide effects. Consider three scenarios: The first, Baseline: No New Freeway or BART, assumes considerable population and job growth, but no change in current local development policies. 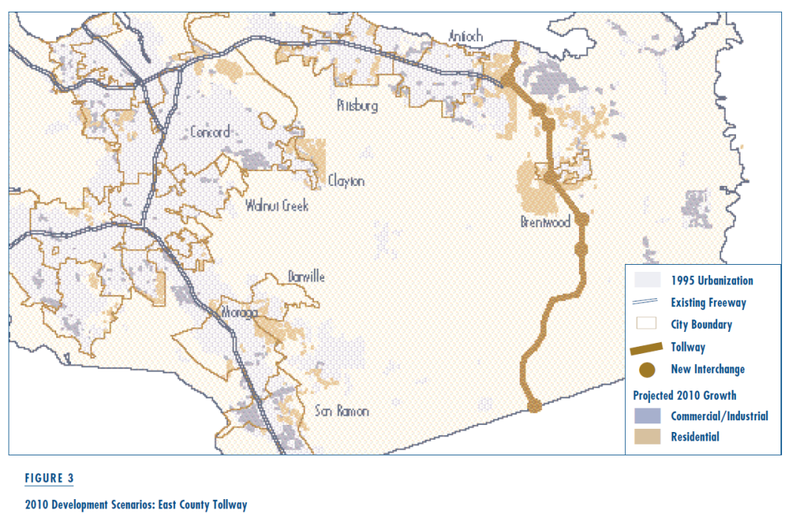 The second scenario, East County Tollway, assumes the same level of population and job growth, along with construction of a limited access tollway running for 75 miles north to south. This very facility was proposed in 1992 by a consortium of land developers, property owners, investors, and construction interests. Proposed as a tollroad, it was to bypass congested facilities in the central and western parts of the county. Environmental interests strongly opposed the proposal, arguing it would induce growth and promote low-density sprawl; that it would encourage conversion of thousands of acres of prime farmland; and that it would threaten precious habitat areas. The tollway’s promoters countered these criticisms, claiming that any negative environmental effects could be mitigated by siting interchanges judiciously. The tollroad proposal ultimately fell through for financial reasons so the validity of these claims and counterclaims was never tested. Figure 1 shows the location of the proposed tollway and key interchanges. The third scenario, I-680 BART Extension, supplements freeway capacity with rail capacity. Specifically, it would extend the Bay Area Rapid Transit system south along the median of Interstate I-680 from the existing Walnut Creek BART station, to the new terminus at Dublin. Two new BART stations would be constructed in Danville and San Ramon. This proposal is purely hypothetical. It has never been suggested either to or by anyone at BART. 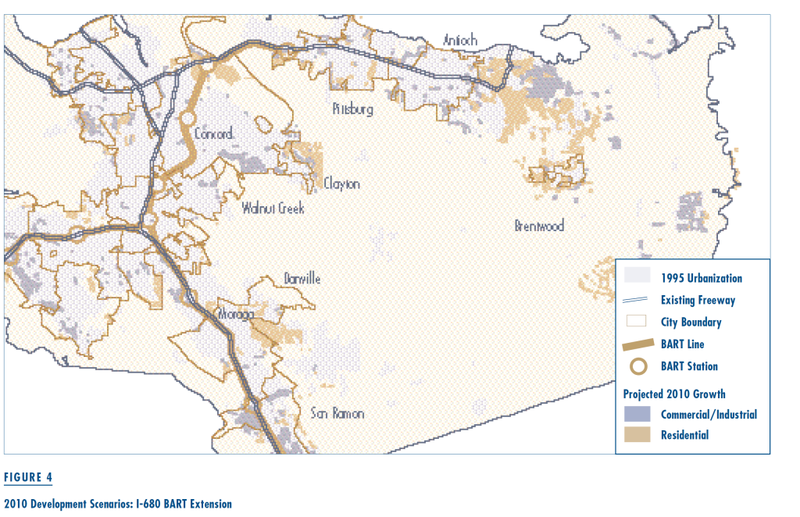 Its purpose here is solely to predict how development might respond to a main rail transit line in a highly congested freeway corridor rich in both jobs and housing.1 Figure 1 also shows the proposed BART alignment. As noted earlier, the CUF II Model is calibrated using actual historical experience. This is both a strength and weakness. It means the model’s predictions are empirically grounded in history, i.e., the period between 1985 and 1995. It also means the model will have difficulty predicting results when there is no historical precedent. 1 The logic behind recent BART extensions has been to serve existing population centers better, rather than to guide future population or job growth explicitly. This scenario adheres to that rationale. Consider the past effects of freeway interchanges and BART stations on development in Contra Costa County—between 1985 and 1995. Among undeveloped sites in 1985, proximity to a freeway interchange exerted a strong and positive influence on single-family and commercial development, but had a negative effect on apartment and industrial development. Vacant sites near freeway interchanges were much more likely to be developed for single-family residential use or commercial use than were more distant sites. Conversely, vacant sites near freeways were much less likely than more distant sites to be developed as apartments or industrial areas. Proximity to freeway interchanges served to discourage residential redevelopment at previously developed sites, but had no effect on commercial or industrial redevelopment. Proximity to a BART station served to discourage all types of new development and had no effect on redevelopment. These effects were different for different land uses and locations. In neighboring Alameda County, for example, proximity to a BART station served to discourage most forms of new development, but to encourage certain types of redevelopment. In other counties, sites near freeway interchanges were less likely—not more likely—to be developed for housing. Assuming no change in current city and county development policies, projected growth will consume approximately 7,950 hectares (about 20,000 acres) of undeveloped land between 1995 and 2010 (see Figure 2). An additional 1,600 (about 4,000 acres) hectares will be redeveloped. Construction of the East County Tollway would reduce the amount of currently undeveloped land required to accommodate future growth to 7,810 hectares (about 19,000 acres), and increase the level of redevelopment to 2,900 hectares (about 7,200 acres). 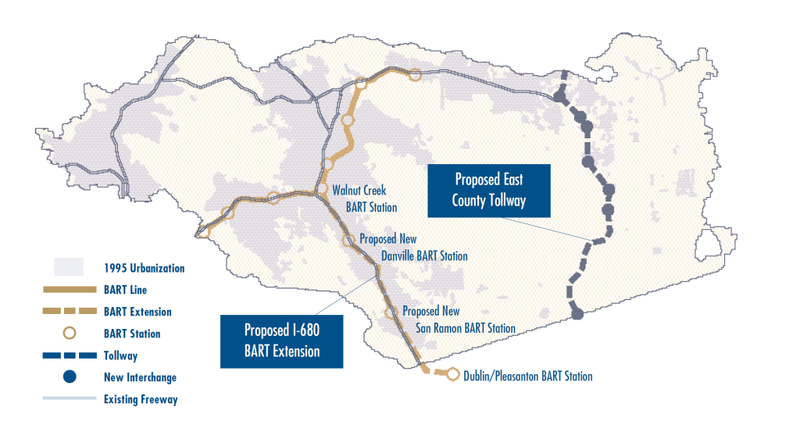 Extending BART service down I-680 would have no significant effect on aggregate land consumption. At first glance there seems to be little difference among the three scenarios. Regardless of the scenario, most new residential development will occur in the eastern part of the county, where land and housing are relatively inexpensive and where the development-approvals process is less onerous. An additional increment of residential growth is likely to occur east of Danville. Commercial and industrial development is likely to disperse throughout the county, favoring available sites near freeways and existing population centers. A more detailed look at the results, however, reveals some significant differences, particularly between the Baseline and East County Tollway scenarios (Figure 3). Allowing for continuation of current growth policies, much of the projected residential growth will sprawl outward, directly east and adjacent to Antioch city limits. Smaller increments of residential development would extend outward from Brentwood in all directions, and eastward from the city of Clayton. Regardless of the scenario, most new residential development will occur in the eastern part of the county, where land and housing are relatively inexpensive and where the development-approvals process is less onerous. The primary effect of building the East County Tollway (with interchanges as shown), would be to shift residential growth southward from the Antioch area to the western edge of city of Brentwood, where it would most likely take the form of an entirely new community. This outcome reflects the still-potent ability of freeway interchanges to attract and organize new development. Construction of the East County Tollway would also affect patterns of commercial development. Instead of occurring willy-nilly at the edge of existing urban development, new commercial and industrial growth would be concentrated in a single major cluster between Antioch and Brentwood and directly to the west of the proposed tollway. Extending BART down Interstate 680 from Walnut Creek to Dublin would have little effect on the overall location and pattern of new development in Contra Costa County (Figure 4). Indeed, with respect to residential growth, there is almost no difference between the Baseline and BART Extension scenarios. With respect to commercial development, the primary effect of extending BART would be encourage a small measure of clustering around the hypothetical Danville and San Ramon stations. All of these results should be regarded with caution. They are based on statistical models of Contra Costa growth patterns as they occurred between 1985 and 1995— models which, with respect to commercial development, do not fit historical experience particularly well. To the extent that future development patterns follow different dynamics and/or respond to different forces, future development patterns could be quite different. Overall, these results suggest that major highway investments still have significant power to redistribute urban development at the subcounty level. Properly located, free- way interchanges can help order new residential and commercial development and, in doing so, reduce sprawl and development fragmentation. Of course the converse is also true: carelessly located, freeways and freeway interchanges may contribute to sprawl. The ability of major transit investments to shape development, at least in suburban countries like Contra Costa, is much more limited. This analysis also suggests that while new highways may channel growth from one area to another, they do not generate it. Rather than focusing on potential growth-inducing effects of transportation investments, land use and transportation planners are well- advised to pay close attention to site planning and development regulation at key transportation nodes. The real contribution of simulation models like CUF II lies in their ability to make complex urban development processes understandable to policymakers and laypersons alike. In doing so, they foster informed discussion of the effects—intended and unintended—of public infrastructure investments, especially transportation investments. They help us to look beyond simplistic questions, such as whether growth is good or bad, and to focus instead on desirable and undesirable growth forms. They also provide a sort of chalkboard upon which different interests can begin to structure tradeoffs and experiment with new approaches. Association of Bay Area Governments, Projections 96, (Oakland: Association of Bay Area Governments, 1995). 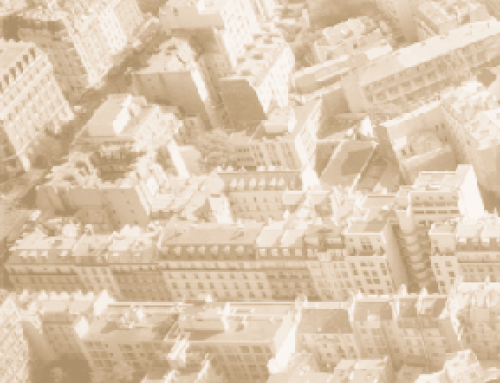 Landis, John, “A New Tool for Land Use and Transportation Planning,” Access, No. 5, Fall 1994, pp. 14-20. Landis, John and Ming Zhang, “The Second Generation of the California Urban Futures Model: Parts I and II,” Environment and Planning B, forthcoming.